An unbelievable spectacle unfolded on the battlefield. A male human in black clothes, who is around one or two heads smaller than the demon, grasps the blade of a thin katana and receives, wards off and repels the blows of a large sword, which likely would mean certain death if it hit, released by a demon with his entire body clad in a black armour. While raising a laughter, Renya repels the demon’s attacks one after the other. Each time the large sword and the katana clash, sparks are sent flying and a high-pitched metallic sound reverberates to the surroundings. The large sword, which was repelled by Renya, has its trajectory twisted and is hurled in a direction not intended by the demon, however each time that happened, the demon forcibly returned it into the proper trajectory with brute strength and connected it to the next attack. 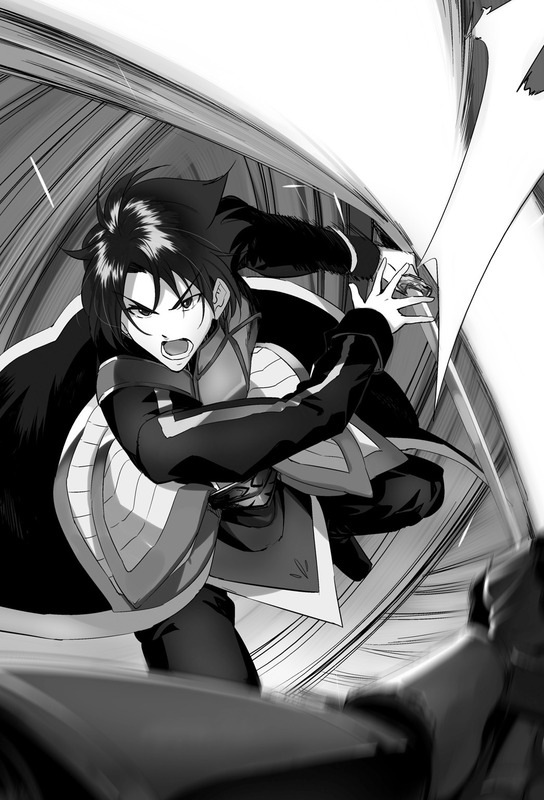 No matter how much the demon roars, no matter with how much strength he wields his large sword, the trajectories of Renya’s slashes never become unstable. With extreme accuracy he repels the demon’s large sword and once in a while his blade reaches the black-full-body armour. Due to Renya’s slashes gradually increasing in speed during the rally, the demon’s expression is tinged with impatience. The demon, who was at last defeated after countless exchanges, temporarily leaped back to recover and regain control. Not chasing there, Renya addresses the demon in a slightly kill-joyed voice. In front of the demon, who was about to answer, more than 10 parallel activated <Magic Bullet> approach from Renya. The demon barely cleared away four magic bullets from those thrown at him with his large sword, but at the moment the blade met with the 5th magic bullet, the large sword broke unable to endure the strain at last. Throwing away the large sword which lost its intended use, the demon roars with mana charged into his voice. Overwhelmed by the magic power, the remaining magic bullets scattered in the air. Renya’s voice resounded from right beside the demon. Renya sunk his fist into the face of the demon who turned in the direction of the voice in panic. The demon, who wants to somehow open up a distance, jumps back at will with the momentum of being hit, takes out a large sword from empty space and restrains Renya by immediately taking a stance. Blood flowed in drops from his mouth and nose. Renya says with an amazed tone while shaking his limp right hand he just used to hit. Before one knows it, the katana has been sheathed into the scabbard at his waist. The demon doesn’t return any words even when he is beckoned. If you look at his body with only your eyes, the armour, which should boast of a considerable defence strength, is riddled all over with cuts similar to gouging it out deeply. It’s the places hit by Renya. It should have been an article of rare beauty which can’t be even scratched by something like a human weapon, but the armour worn by the demon has ended up tattered in the exchange of blows with Renya in a short time. Once you turn your sight at the discarded large sword, the result of the exchange can be seen over there as well since the large sword is cover all over in cracks. It was something Renya doesn’t know, but this demon wields swords which have his own mana loaded into them. That’s why it’s far more sturdy than a regular sword and its power is high as well. On top of that it’s possible to use long range attacks with it. And in addition to that it could even repel spells. The demon harbours fear due to the fact that such large sword didn’t withstand Renya’s slashes. It’s an impossible story for a human weapon. The demon becomes speechless due to the readily given reply. Although she was certainly a suspicious peddler, Renya adds in his mind. Renya indifferently nods to the words of the demon which resembled a scream. No matter how surprised the demon is, Renya isn’t able to understand why that’s the case. The demon stresses it with a force that bubbles foam from his mouth, however for Renya it doesn’t click even now. To begin with, since it was an item I received from that little girl at the time I was send over to the world here, isn’t it obvious for it to wear the name of being a remainder of the age of gods? That’s the extent of Renya’s thoughts. Moreover, no matter how amazing you call it, the thing itself is a bamboo sword. From Renya’s point of view, he can’t understand what’s so great about that at all. Due to Renya’s expression not changing overly much, the demon stared at him with a look as if he is seeing a ghost, but pulling himself together right away he yells out loudly so that it echoes in the vicinity. Renya tilts his head to the side due to the strange order the demon began to give. Goblins and orcs, who heard the demon’s order, started to surround Renya. Renya frowned asking himself “what is that guy talking about?”, but the demon doesn’t care about that. At that time the matter with the elven race had already completely vanished from within the demon’s mind. Rather than such trivial matter, if I don’t immediately return to the country with the information of this weird human, is the thought that is driving him. Not only can he fight above equal with me, who is a demon, in the body of a human, but he has a history of having possessed an artefact. Moreover, letting go of that he obtained a weapon that isn’t imaginable with common sense as item. Even though it’s already abnormal for a human to fight with a demon by himself, the normally unthinkable idea of letting go of an artefact and instead obtaining a weapon is an absurdity. Moreover, although it’s just my intuition, wasn’t the existence of this human the driving force behind the scenes for the tenacious resistance of the elves this time? The demon wonders. Isn’t it possible that this will become a threat for the demons? He considered. Renya, who was utterly amazed, looks fleetingly at the orcs and goblins crowding around him. Although it’s for an instant, the feet of the monsters stopped due to the pressure in his gaze. Although it’s only a small amount of time, this instant is more than enough for Renya. While displaying one rotation by turning around his body right there, the flash of unsheathing his katana from the scabbard runs through the bodies of the monsters, who surrounded Renya, splits them apart in an instant and changes them into meat. Without even looking at the lumps of meat dropping on the ground, Renya ran while aiming at the demon who is in the process of switching to escape. The monsters, who stand in the way as they loyally execute their orders, are cut on the spot and spill their blood on the ground. Even though the demon released a slash in desperation in order to mow him down, it doesn’t reach Renya’s body. In the next instant when the demon thought he dodged it, Renya’s figure stood right in front of the demon’s eyes. The point of the katana, which is held by the asking Renya, is piercing very deeply into the demon’s right thigh from right in front. A groan rose from the demon’s throat due to the delayed pain. Renya, who turned around the katana with a grinding sound as if wrenching open that wound, extracts the katana from the thigh after spending plenty of time to enlarge the wound. Spilling the blood which followed the pulled out katana, the demon reflexively drops his large sword and goes down on his knees, but Renya sends a flying kick at the collar of the demon, who had lowered his body due to him falling to his knees, and makes his body topple to the ground. Once Renya points at it while sighing, the demon sidles up to his own weapon while trying to crawl. Did he finally realize that he had dropped it? Renya, who went ahead before the demon can grab the hilt of his weapon with his hand, sent the large sword flying by kicking it into a distance where the hands of the demon won’t reach. Is the side of the foot, which was pierced by the katana, restricted? The demon wasn’t able to stand up even if he tried to do so, but somehow he advances by struggling on the ground to get away from Renya. Renya looked at that appearance with a cold gaze, however before long he slowly followed him while carrying the drawn katana in his hand. His words are very calm, but the atmosphere emitted by him is changing little by little. While feeling something cold travel down his spine, the demon cried. Rather than the demon, who is crawling on the ground, the speed of Renya, who is walking normally, is naturally faster. Renya, who caught up right away, casually raised the katana overhead. In response to that, the demon raises his left arm and protects his head. The black iron armour had certainly suffered deep cuts from Renya’s slashes, but there still isn’t a place where it has been cut apart. The demon thought that it was something that will be able to protect him plentifully. He swings down the katana quietly and soundlessly. It wasn’t a fast sword attack, but it was a very calm hit that caused a somewhat painful reaction. The demon, who watched that in a daze, isn’t able to do anything but simply stare as the left arm, which was severed from the area around the elbow together with the black iron armour, drops without being able to say anything after several seconds since the katana passed through. Renya says while looking down on the demon who began to writhe in the attacking pain while he suppresses the blood, which spouts out from the cut off elbow, with his right hand. His look is ice cold and his thick thirst for blood is spreading to the surroundings. Since the time when the atmosphere around Renya began to change, the monsters have left in order to escape from Renya. That was their nature, which sensed something dangerous to their lives, being able to use its intuition albeit having low intelligence. They know, whether they want to or not, what’s in the range of that’s hands is close to looking into the abyss of hell and it won’t be strange for them getting kicked down there at any time. Once they understood that, no matter how small their intelligence may be, even among the monsters like goblins and orcs there isn’t a single one to do something reckless like trying to approach Renya. There’s no reply to the inquiring words of Renya. Renya’s words don’t reach the ears of the demon who had his arm cut off and sent flying. Renya, who looks at that demon’s state with a sullen expression, once more swings the katana at the area around the left leg’s knee in a casual manner. The black iron armour, which caught Renya’s slashes, albeit only somehow, until now, was unbelievably torn to pieces and the demon’s left foot was completely cut off from the knee. Once he replies to the question by the voice of Renya, who was filled with blood thirst, the demon begins to beg for his life as he had already lost any shame and honour. The demon tries to get away from Renya with his remaining limbs. The blood, which flows out from the wounds at the limbs which were cut off, had quite the force and quantity. While thinking I guess he won’t last long if it’s like this, Renya gets close to the struggling demon after picking up the demon’s large sword he kicked away himself, traps his foot with his body and turns him over so that he is lying face down. His aim is the border between hips and torso which are the moveable parts. Once he stabs that part with all his strength while holding the demon’s large sword in a backhand grip, the large sword penetrates the demon’s body from a gap in the armour and and affixes his body to the ground. The scream of the demon echoed throughout the forest’s night. Disappointed that Renya’s blabbing his mouth again with potentially crucial information. Said every Bond villain ever. Disappointed that Renya’s blabbing his mouth, like come on just kill the dude. Really wish the author would lay the stupid bamboo sword to rest. Entire thing is based on the most incomprehensible claim to supremacy ever. I am sure that he get the bamboo sword back once the one he has is damage and can not be repaired. But I have feeling it will be a long time for that. Wasn’t the the paddler that exchanged the bamboo sword to his current sword an angel? The indestructible blunt weapon was exchanged to an indestructible or nearly indestructible edged weapon. I am not so sure about the angel being peddler and can not remember that chapter. But if what I remember the bamboo sword was level 10 and the sword he has right now is a level 7. The peddler is an angel it was in the side story. I can not remember if I read the side story but I should check out. Thanks. Thanks for the chapter. I remember there was big talk about how in was foolish Renya traded his bamboo sword for this one. And man the death of the demon was overkill to me. I know I won’t be telling Renya any secrets. He’s too loose with his mouth. I’m glad you’re having fun, but the more time you play with the Demon, the more elves (inc your reward-inducing target) may die, renya.